Truly, your dad is one of the most important person in your life . In case, you just had some misunderstanding with your dad or you think you just hurt him through some unpleasant words or bad behaviour; then there is nothing more important but to say sorry and apologise to your dear daddy. 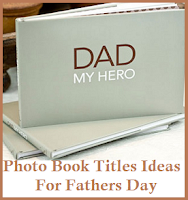 If you are at loss for words what to write in a sorry note to your father then help is at hand. 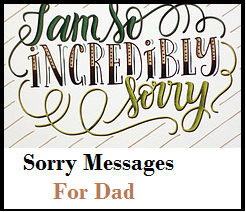 Here are some samples of sorry messages for dad that you can use. 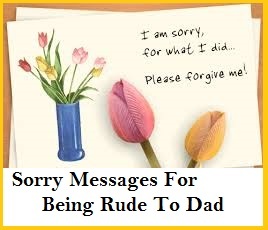 Go ahead and find the perfect wording for the sorry messages to father which you can send by SMS, e mail or a sorry card. Daddy, I’m sorry for being so childish. I’m sorry for what happened. I know I shouldn’t have said those words. I know that you are disappointed with my behaviour. From now on, I assure you thant I will be a good boy/girl. I’m really so sorry! Dad, you are so dear to me and I want to say sorry for my attitude last night. I know that it was so disrespectful. I promise to always be calm and quiet. I love you and I’m indeed sorry. Dad, I want you to know that I feel so bad and really guilty to what I did to you. I’m sorry for being so rude and disrespectful. It’s a big mistake and I’m really really sorry. My dear daddy, I know I hurt you dad and I’m sorry about it. I respect you as my father but sometimes I act so childish and I’m sorry. I have realized my mistakes and I want to make it all up to you. Please forgive me Dad. Daddy, I’m sorry for letting you down. I will do anything to make you happy again. I’m really sorry daddy. I promise to improve myself. I know that I behaved badly last night. I’m sorry because I upset you. I love you dad .Please forgive me. Sorry daddy because I act badly and I know you were upset with my attitude. I humbly express my apology. I’m sorry for everything dad. I wish to be a good girl/boy always. Sorry daddy and I hope you can forgive me. I promise not to do it again. I love you. Daddy, sorry for the mistakes which I know it hurts you a lot. I want to be a good girl all the time and I promise to do it for you. Sorry daddy. I’m so sorry daddy for hurting you with my words and attitude instead of comforting you with hugs. Please forgive me daddy. I’m very sorry! I thought that I was doing the right thing because all my friends call me “cool” but I was wrong. I have changed into something which I didn’t notice. Sorry dad. Since from the start, you always want the best for me in this world. But sometimes I become so disrespectful. Daddy, I just want to say sorry if sometimes I upset you. Dad, I’m sorry for the fight last night. It was a terrible misunderstanding. I hope you can forgive me. I love you and I didn’t mean to hurt you. I’m really sorry. That night, I was the worst daughter/son to the best father in the world. I’m sorry dad. I promise to be a good boy/girl. I love you! Dad, I have realized my mistakes. I want to say sorry daddy. I love you. Hope you will forgive me. Your dad is the one who taught you how to ride a bike, held your hand when you took those first steps and the one who has been by your side since you were born. If you have been rude and hurtful to your dad, you need to apologize as soon as you can and tell him how much you love him. Read on to find the perfect sorry message for being rude to your Dad. Hey Dad, I am sorry how our last conversation ended. I know I was rude to you and I am really sorry for that. Would you please forgive me? I love you! I love you dad and I don’t know why I was talking to you disrespectfully last night. It was wrong of me to do that and I realize it. That is why I want to apologize to you. Sorry! You are the one who was by my side when everything was wrong and all I did was lash out at you. I am so stupid. Please forgive me dad, I love you so much. It was so wrong of me to talk to you like that. I know I was just being a jerk but I did it anyway. Please forgive me for being like that? You had always taught me how to talk to my elders and all I did was forget that and be rude to you. It will never happen again. I am sorry. I have been going through a lot dad and I am sorry I took it out on you. Let’s go out for dinner? It’s on me! Would you forgive this stupid daughter of yours that love you so much but sometimes acts a little stupid? I am sorry for being rude to you dad. I took all my anger out on you when I should have just come to you for advice on how to deal with my problems. I am sorry dad. I have been holding a lot inside me and it just burst out on you last night. Can I please talk to you about what I have been going through? I was stressed and it was wrong of me to have taken it out on you. I am a horrible son. I am sorry. Can I come give you a hug? I really want to tell you how sorry I am.